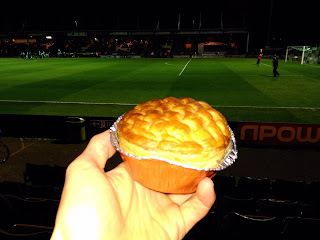 Please note: When writing this article I believed that the pie I was reviewing was made by Wrights but Yeovil have told me they have a number of different pie suppliers (just to confuse us!) including Wrights, Pukka and some homemade pies. However, on this occasion the pie was made by a Somerset company called Penny Lane. This explains why it was different to the other Wrights pies we have previously reviewed. Yeovil Town's calamitous plummet from the Championship to League Two provided a new club to add to our Football Pie League when we visited Huish Park on Tuesday. An enjoyable game saw Wycombe grab the 0-1 win. Whilst it was a decent performance from Wycombe, Yeovil offered very little and now sit bottom of League Two. Could a third successive relegation be on the cards? Certainly the heady Championship days seem a long time ago now with an attendance of only 2,963 for the match against Wycombe. Arriving at Huish Park it was hard to believe it was ever a Championship ground, it is only 9,565 capacity and one of the terraces is completely open to the elements. I believe this is traditionally where they put away fans but I was quite glad that we were sitting down undercover in a corner of the Screwfix stand. The stand that we were in did seem fairly modern with decent enough facilities, but did this bode well for their ability to cook a pie properly? This being the South West I had feared that pasties might dominate but there was a healthy choice of 3 pies; Steak & Kidney, Chicken & Mushroom and Chicken Curry. There was no indication what company might make them but after some consultation the staff and myself concluded that they must be Wrights Pies as that was on the packaging of the Steak & Kidney pie. Those of you who know your football pies will know that Wrights are quite common at football grounds. We have previously reviewed their football pies at Cambridge, Northampton and Wolves as well as a review of their shop bought Chicken & Mushroom. Recently I have noticed them spreading further from their base in Stoke (I have recently spotted them in my local shops around Gloucester) so it seems there are growing their Em-pie-re. Previously they have been solid but not outstanding performers and so it was again today. I opted for the Chicken Curry, I thought it was going to be the same as I had reviewed at Cambridge but was pleased to note that it was subtly different, that one having been Chicken Balti. This option had a filling more similar to chip shop curry sauce (a bit similar to the Peter's version). It wasn't particularly spicy, I found it a little boring but it was pleasant enough. It was very salty (too much so) but also slightly sweet in places. There were some small pieces of a red vegetable which I guess was chili. The chicken was in small chunks but was pleasant enough. The pastry was soft and stodgy but fairly tasty. It was unbelievably greasy though, the underside of the pie was almost dripping in grease, perhaps the most greasy pie I have ever eaten which is saying something! 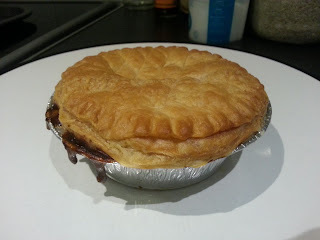 The most positive aspect of this pie was that it was well cooked, we often complain about badly cooked or dried out football pies, but this was cooked through and piping hot. In fact it was really too hot, I was so hungry, it was burning me. It wasn't just burning my mouth because this pie was disintegrating as quickly as I was eating it, there was no structural integrity at all which is really not what you was when trying to eat it with your hands. At £3.20 it was on the more expensive side for League Two but it is good enough that I would have another on my next visit to Yeovil Town. P.P.S. Sorry about the title of this post, I think it is my worst attempt at a pun in a long time, but I couldn't think of anything better! continue reading "Yeo Will Like this Pie Review"
We Pierateers of pie review website www.pierate.co.uk are today celebrating our 6th Birthday, and we'd love you to join us by simply eating a pie and rating it! It follows in the footsteps of the very first International Pierate Day in 2013, which was once again celebrated last year. But we don’t want you – pie lovers worldwide – to just sit at home and watch as we eat all the pies! Oh no! Pie eating and pie rating is something we can all enjoy. Something that can bring friends, family and communities together. Pies are celebrated and eaten in so many countries worldwide and so today – marking our sixth birthday – we would love you to join us in eating and rating pies! 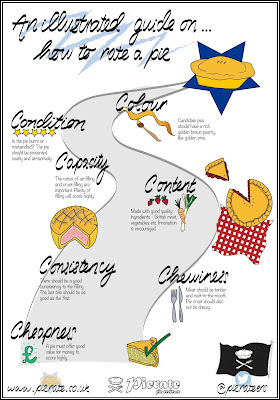 And to celebrate the occasion of our 6th birthday, we commissioned fellow food blogger and amazing illustrator Emily from www.recipesandreviews.co.uk to create us this lovely, personalised print - an illustrated guide on how to rate a pie, based on our 7 Cs of pie rating! So once you’ve found a pie to eat – whether in the local bakery, butchers, supermarket or your favourite pie shop or one you have made in the luxury of your own home – why not rate your pie using the Seven Cs of pie rating in our lovely illustrated guide above? In addition to celebrating #InternationalPierateDay today, we are also delighted to announce that Chris from MyPie London is coming to Birmingham to serve up his highly rated pies for our 6th Birthday Pie-rty on 14th November! We can't wait!!! His Chicken pie scored a whopping 6.39/7 just a few months ago! But his Steak and Ale was not to be outdone, scoring 6.61/7 and rating as #3 on our list of over 500 pies rated! Well, first things first - you need a pie (or two!) For insPIEration you might find our Pie Rankings helpful, with over 500 pies we've rated and reviewed over the past 6 years! Or perhaps you want to make one of the pies our Ship's Cook has made, following her reci-pies here. 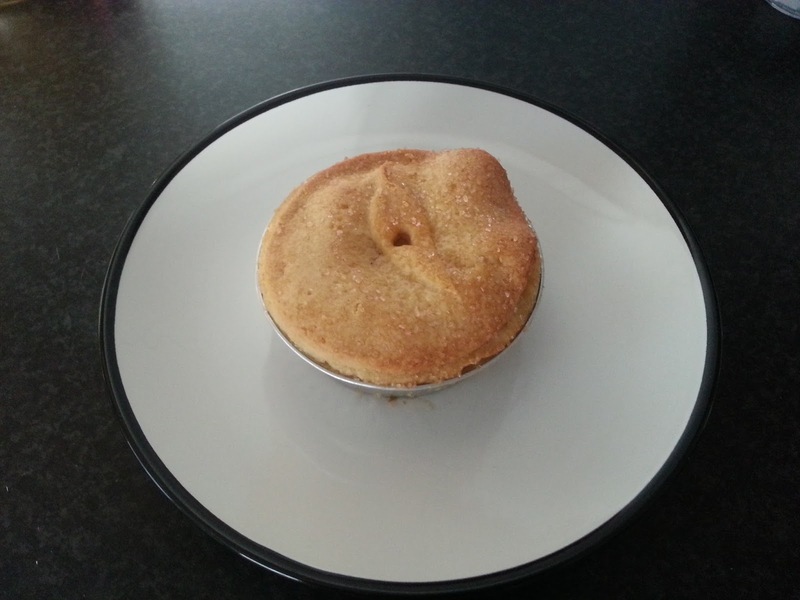 continue reading "International Pierate Day 2015"
Bring on the Bramley apple pie! I do love apple pies. You might consider me a bit weird for this (and perhaps for many other reasons too...), but I think I prefer cold apple pie to warm apple pie. Just me? Here's an apple pie that admittedly I tried quite a while ago but absolutely loved at the time. 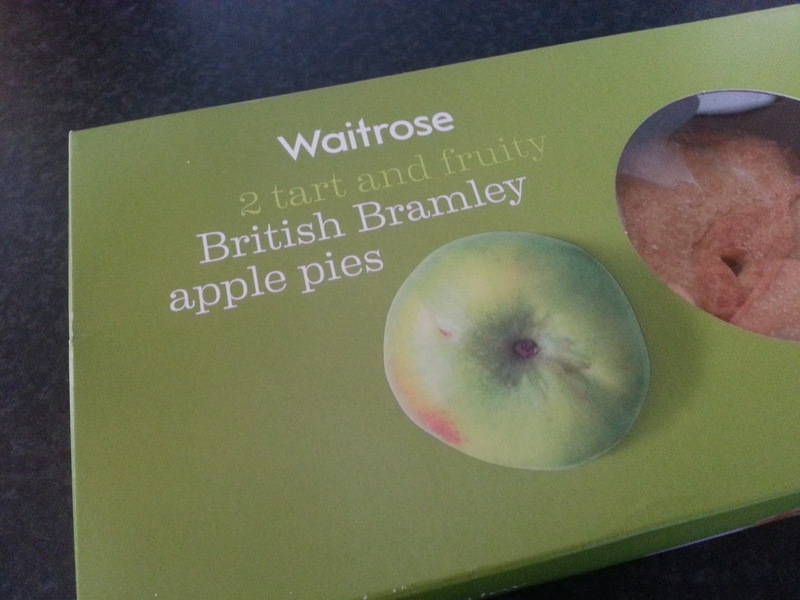 These are two 'tart and fruity' British Bramley apple pies from purveyors of fine pies Waitrose. Currently on sale at £2.79, these pies are certainly not at the cheap end of the spectrum. It's certainly larger than your average Mr Kipling apple pie, but at £1.40 per pie, you'd expect a sizeable pie for your money. I'm not quite sure the size of this pie matches up with its price tag - so I'm hoping this pie makes up it for when I taste it. Cutting open the pie reveals some wonderful large chunks of Bramley apple. There is a definite air gap, but the filling does look delicious. The pastry cuts nicely, with the perfect balance of crunch and softness. The apple is wonderfully fluffy and juicy, and complements well with the smooth puree sauce - a perfect mix of consistencies. There's a fantastic tart-ness to the taste of this pie - it's not too sweet or artificial, it tastes real and authentic. The pastry is also very tasty, which a part of the pie I've often found ignored. Interestingly, Bramley apple pie filling has received protected status from the European commission. This means that the filling must contain "a blend of fresh Bramley apple pieces, sugar and water, with the option of Bramley apple puree, cornflour and lemon juice" - any else simply won't cut the mustard. The recipe for a Bramley apple pie filling dates back to the 1880s. This was a delicious apple pie, and I could have eaten both! It's main drawback, however, was its price, along with its air gap. continue reading "Bring on the Bramley apple pie!" So we've tried the Waitrose top crust offering - and we detailed some of the shortcomings of a top crust pie - and now is the chance for the fully-encased pie to show why it is the superior pie. 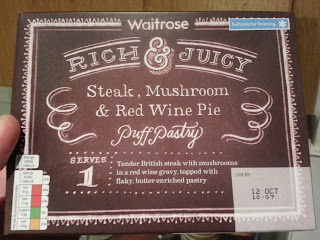 This is a Waitrose Rich & Juicy Steak, Mushroom & Red Wine pie with puff pastry, and costs £2.00. It's made with British steak, and is surrounded with butter-enriched pastry. Out of the oven, the pie is a lovely golden brown colour. There's no boil-out, unlike its top-crust counterpart, so the pie is in good condition. Cracking open the pie, however, reveals that it is lacking in real structural integrity. Despite picking a sharp knife, cutting this pie open for the cross-section means it just collapses on itself, oozing its red wine gravy out over the plate. It's therefore hard to fully ascertain the extent of the air-gap in this pie, but I could still see that this pie was not entirely filled to capacity. The content was tasty - the gravy in particular was delicious and rich, and the meat was nice and tender. I could have done with a bit more steak in the pie, however. At £2, this is a decent price for what was a quality pie. It's by no means the cheapest supermarket pie, however, but you could do worse. While this pie may have collapsed when I tried to cut it (meaning it would be hard to pick up and eat with your hands), you can still clearly see it is vastly superior to it's lesser top-crust cousin. Fully-encased is always the way to go. Case closed. continue reading "The case is closed on fully-encased pies"
With an ever expanding list of football pies being reviewed in our PIEremiership, there was one noticeable football pie manufacturer missing. 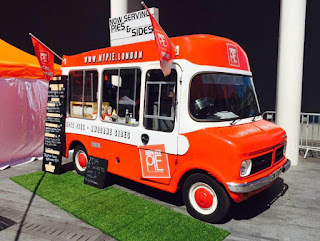 Having won multiple awards at the British Pie Awards over the past few years, both in the football pie category and beyond, we still hadn’t yet been to a ground selling Piglets Pantry pies. That all changed with an invite by MK Dons to rate their pies before their Championship tie with Blackburn recently. 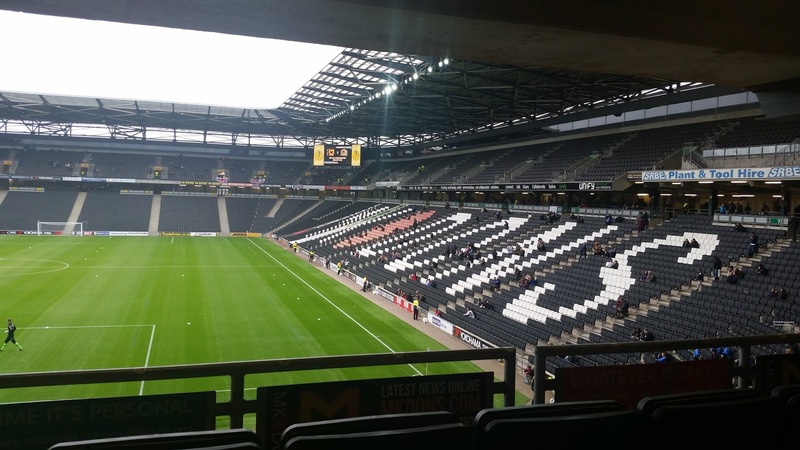 We were delighted to be offered the chance by Stephen Miller (Food and Beverage Operations Manager) to head to Stadium mk to sample some of their pies, which included the Steak and Concrete Cow Ale pie which has been exclusively produced for MK Dons. This – as I found out talking to Jo Hunter from Piglets Pantry, who kindly came up from the south coast to meet us and talk us through the pies – was one of many things that help Piglets Pantry stand out from the crowd. They regularly talk to the clubs/businesses they supply and the supporters who are buying the pies to get their feedback and aid them in developing new products. For me, this is one of the distinct advantages of having a small, personable pie business supplying the pies in a football ground, as opposed to the more homogenised mass producers sold within many UK stadiums. You get pies that the local fan base can connect with, support and recommend. Indeed, the Steak and Concrete Cow Ale Pie had been developed with a group of MK Dons supporters and using a local ale, a personal touch that seemed to be going down well with the fans there! Sales of Piglets Pantry pies at their local football club, Brighton and Hove Albion, seem to back this up. Since taking over the pie supplying their ground sales have rocketed from 1,500 to 10,000 pies a match, which is quite phenomenal! It certainly shows that if the quality pies are there, people will pay a bit more for a premium product. It’s therefore no surprise to see the pies being sold in more grounds, including hospitality at Chelsea and West Brom, plus recently in Twickenham and the Millennium Stadium for their Rugby World Cup fixtures. 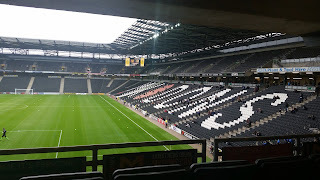 Back to MK Dons and the pies to rate were the Steak and Concrete Cow Ale Pie, the Chicken, Gammon and Leek Pie and the Spinach, Mushroom and Ricotta Pie. 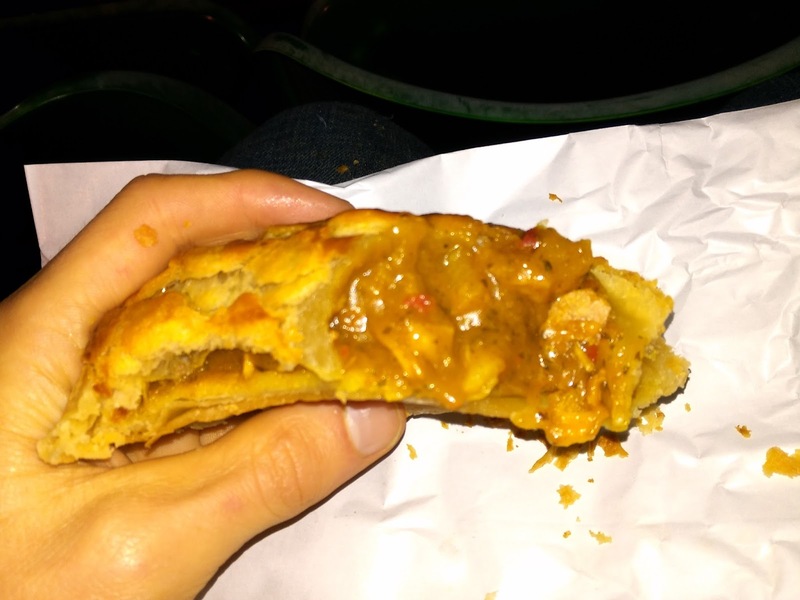 They also had a special on that game – the Chicken Balti Pie – which Pierateer Sam has his eye on when he visits, as our resident Chicken Balti football pie expert! I was impressed with this range of pies available to home and away fans, with MK Dons putting on a special pie for away fans dependant on where they were from. It’s one of the few clubs I’ve found where they are actively looking out for the needs of their fans, rather than just giving a very generic catering experience to all. Onto the pies and my overall thoughts are that these are premium pies being sold at a very reasonable price, especially for a football ground, at just £3.50. The pastry is shortcrust around the sides and base, with a puff pastry lid. It is noted that these pies do not contain lard or suet, giving them a paler colour but also a lighter, crisper pastry. This means the pastry is less moist and can hold the filling in thinner, crisper pastry. 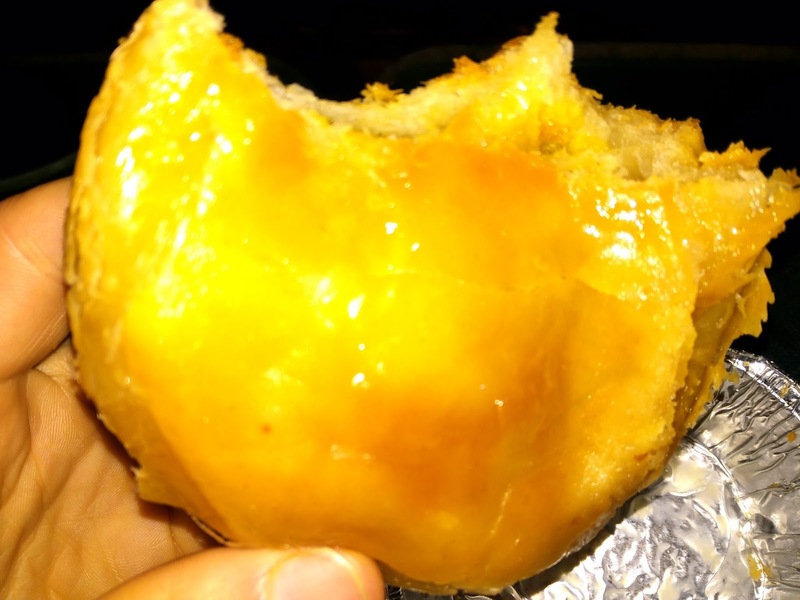 While this different pastry did take a little getting used to, having primarily eaten and enjoyed butter-rich pastry which is more golden and softer, I enjoyed the firmer crunch this pastry had and it did feel a lot lighter and less stodgy as a result. The main downside was the outer rim of overhang pastry which was a bit too dry, but the rest of the pastry when eaten with the filling was well balanced. 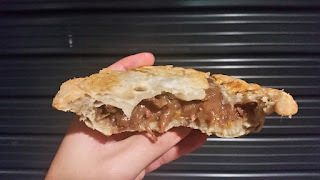 All the pies held together brilliantly when eaten by hand, with generally a great consistency to the fillings, which is ideal for a football pie. 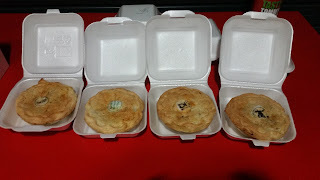 The capacity was very strong in all of them, with the meat pies particularly standing out against most other football pies in terms of the strong meaty content and packed filling. First up to rate was the Chicken, Gammon and Leak which is a regular on the menu at MK Dons. 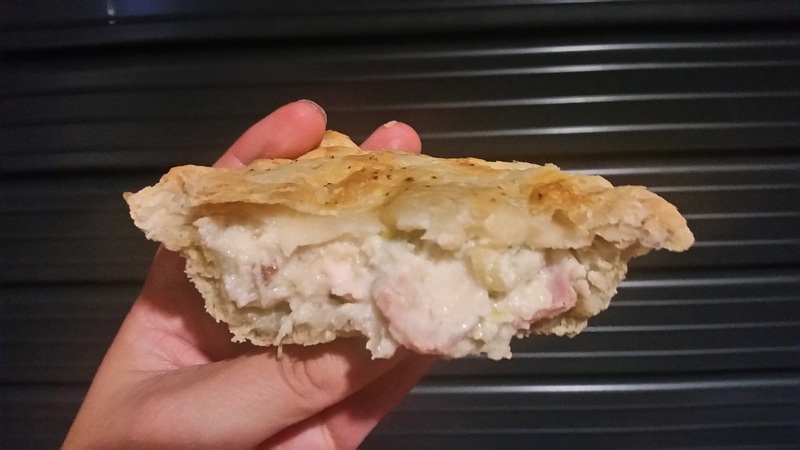 The pie was packed with a nice blend of chicken and gammon in a light béchamel sauce, spread well throughout the pie filling. The chicken was lovely and tender, the gammon not too chewy and the leak complemented the flavour well with the white sauce. 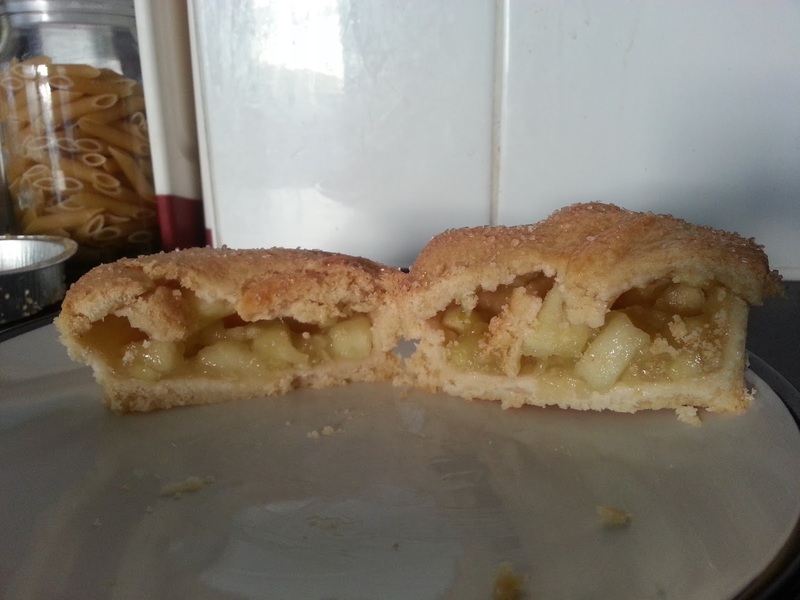 The consistency of the filling was good for a hand held pie and balanced the crisp pastry well. Overall a top quality filling and while the rim, side and base pastry was a little too dry and crisp for my liking, I’m sure many would love this pastry and it well deserving of Pierate Highly Recommended status. There’s no denying we love a good steak pie on the Pierate Ship, so it has to be a top, top flavour to challenge for the top spots in our pie rankings. We very much appreciated the lengths Piglets Pantry had gone to in order to create this pie with a local ale to the MK Dons, creating this pie exclusively for the team after meeting with local fans on a taster day. The meat was good quality and the gravy had a good viscosity to it for a football pie. Another good pie but we felt it didn’t quite match the Chicken pie in terms of the mix of flavours. No doubt it would however still be very popular amongst the steak pie fans at the game! It’s worth saying from the start that this was one of the best vegetarian pies I’ve had! I’m never normally one to go for the vegetarian option if there is a meat alternative (especially if they are sold at the same price), but this Spinach, Mushroom and Ricotta pie had such a rich flavour, with a delicious light runny cheese sauce and complementary spinach and mushroom content that I didn’t really miss the meat! In fact my friend Martyn was tempted to convert to veggie pies after eating this one! 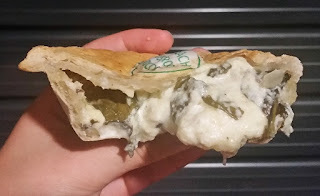 The filling was nicely balanced and while the consistency of the sauce was a little too runny to easily eat with your hands, it complemented the pastry well. 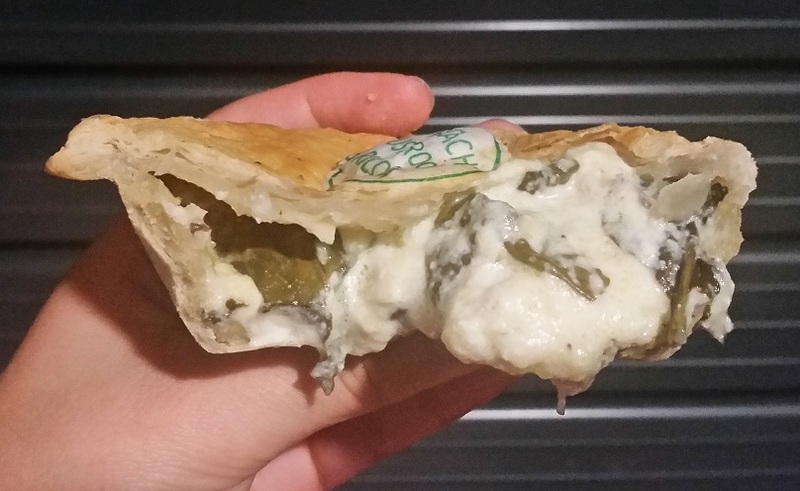 This pie was second in the Vegetarian pie category of the British Pie Awards 2015 and you could easily see why! Overall then a great selection of football pies at MK Dons, with one of the best vegetarian pies we’ve rated to boot! 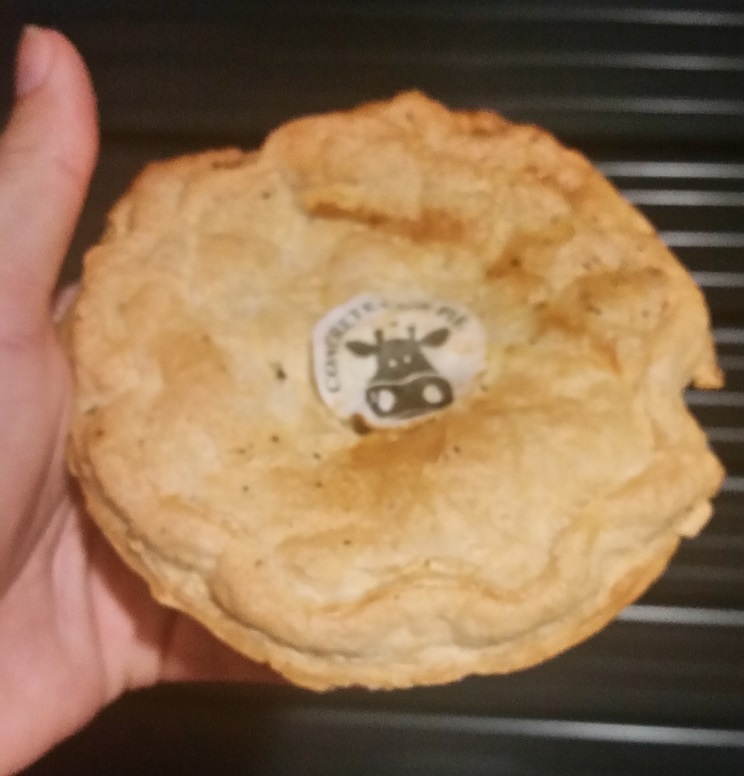 It means Piglets Pantry have achieved what only two other clubs have – a Pierate Highly Recommended football pie – and puts them comfortably into third place in the PIEremiership. My thanks once again to Stephen and Jo for their hos-pie-tality at the game and, of course, the very good pies. We look forward to trying some more of the Piglets Pantry range soon! 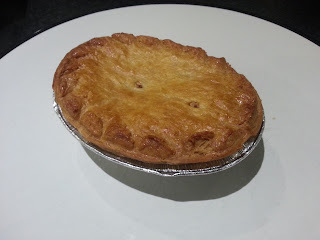 continue reading "Top Football Pies from Piglets Pantry at MK Dons"
Normally, when it pops up in conversation that I write for the pie review blog Pierate, a common question for people to ask is "What do you think of those top crust pies?" And I tell them: "They are not proper pies!" And then some people can be rather taken back by this. "It has to be a pie," they say. "It has pie in the name." Well with this post I hope to convince you (if you hadn't already been convinced!) why the top crust pie is vastly inferior to its mainstream cousin, the fully-encased pie. I appreciate I may be preaching to the converted here, but I hope this pie will be the final nail in the coffin for all those 'false pies' out there. 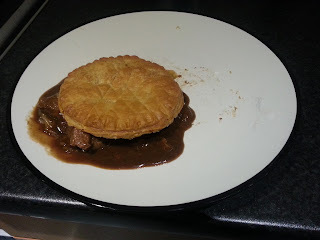 Exhibit A: Dark & Velvety Aberdeen Angus Steak & Ale Top Crust Pie. Purchased from Waitrose, cost £2.99. 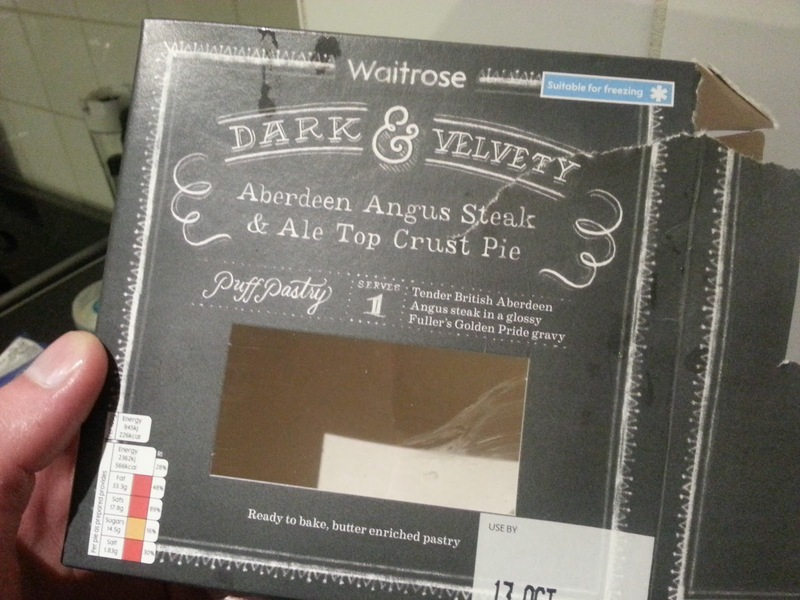 Waitrose even know that the top crust pie is the inferior product to the fully-encased pie - that's surely why they've put it in the name, so you can avoid disappointment later! Out of the oven, the pie does look fairly nice. It has attained a nice golden brown complexion, and the puff pastry has lived up to its name. However it is let down by the boil out on the left hand side of the pie. Boil out, of course, that's resulted from this being just a top-crust pie. If this pie had the correct infrastructure (sides and a base), there wouldn't be gravy dribbling down the outside of the casing. Now, onto the next problem with a top crust pie. How do you eat this thing? 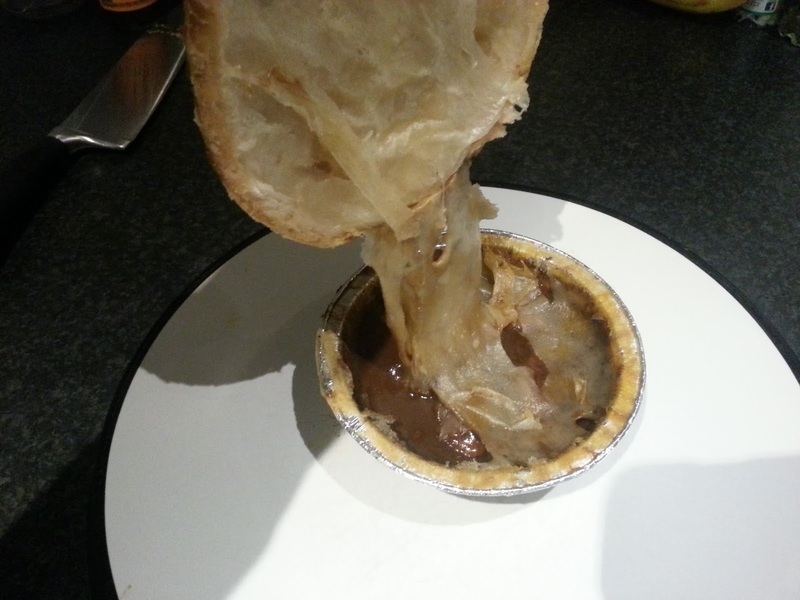 Lifting the lid on this pie reveals long strands of flabby pastry trailing off the lid and flopping around in the gravy soup below. Clearly this isn't the effect Waitrose are going for with this pie, but what other option do I have to get this pie out of the foil tin? Unless I'm meant to eat the pie in the foil? That can't be right, surely? Okay, so I've got the pie out of its foil bath tub, and now its swimming around on my plate, topped off with a raft of pastry. I hope you can see now why the top crust pie is inferior - I might as well have just had a stew! The filling itself tastes very nice. 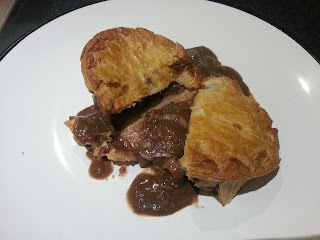 The gravy has a very smooth consistency (some might say 'velvety'), with a fine taste of Fullers ale, and the pastry at least tastes nice and buttery, even if it doesn't go all the way round. Together, it's a nice combination of flavours, and the meat is not chewy (which is always a good thing). Cost-wise, £2.99 is at the upper scale of a supermarket pie - especially an own brand, 1 person portion - so unfortunately it will lose a few points there. Although you could taste the quality in the filling, overall this pie was not a great experience for me and I personally couldn't recommend it. Hungry for more? View all of our Waitrose Pie Reviews! 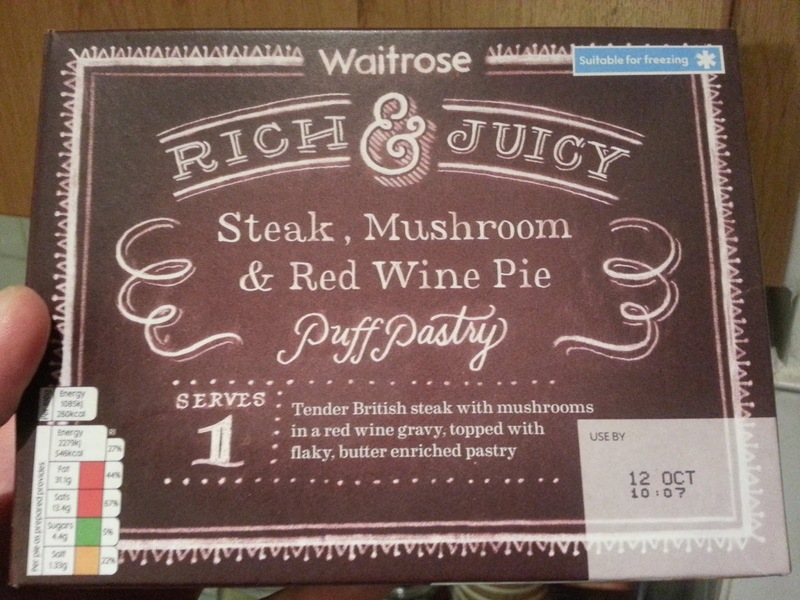 continue reading "Waitrose top crust pie - the clue's in the name"